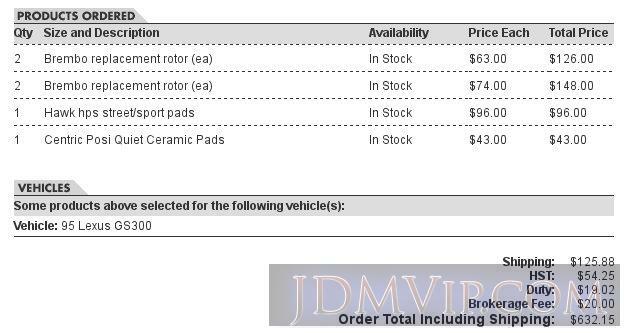 I was looking for a good set of rotors and new pads for my Aristo because the current ones (likely OEM from the factory) were badly warped and causing extreme vibration when braking especially at highway speeds. On my last Aristo (the 147 from Brave Auto Japan) when I did the brakes I went all out and got Brembo disc front and back and Hawk HPS in the front. The setup was good and braking improved somewhat (not what I expected from Hawk and they were very noisy). The cost was about $630 and unfortunately within months of installation that Aristo was rear-ended and written off. So this time I thought I'd be smart and see can I get a decent product for a bargain basement price? I bought these from Amazon for just $21.21 USD including shipping for a single disc. For both front discs the cost was 42.42 USD (or about $55 CAD!). Interestingly enough the C-TEK's are also E-Coated like the Premium Centrics (just without the Premium or higher price). Just for fun I found the old Tirerack order for the Brembos, Hawk front pads, and Centric rears. I am very happy with this setup and don't think there's any reason to spend more. I will always buy C-TEK Rotors and Pads for my cars after this experience. I got a bargain and a huge improvement in the braking department. One thing I want to mention in case others get a scare like I did is that my brakes smoked like crazy when I did some spirited braking after installation. I didn't notice it until I got out smelled burning acid and saw plumes of smoke coming from my front rims. There was enough that I was worried that a fire had started . But apparently this is all fine and normal, it was either from the pads or more likely the "Cosmoline" my father-in-law told me to remove from the rotors with brake clean but I didn't . I never had smoke again so I think I bedded in the pads well lol (if you continue to have smoke then you may want to worry and make sure you don't have a stuck caliper). This seems to be normal whenever I replace pads on a car but I get a groaning from the brakes (like often when a car is braking in the wet and coming to a final stop or releasing the brakes). After 1.5 weeks this is starting to go away so I think it's normal. There are no audible sounds from outside like screeching that the Hawk HPS's in the 147 Aristo used to make. I just want to mention that these pads are Premium and also "Scorched" for easier bedin and was not mentioned in any of the description AFAIK. These have definitely improved the braking in Aristo dramatically. I can stop short and easily and they are silent. They seem to brake much better than what came in this 161 Aristo or the 147 and resist fade quite well. These were so cheap so I worried but what did I have to lose when my rotors were warped to death and these cost $55 CAD shipped for the front set? In truth they don't look, feel or perform any different than the expensive Made in China Brembos I had on the old JZS147 Aristo . I read good things about Centric over the years but not many detailed reviews but many comments from AutoXers to just go "Standard" and that interestingly slotted and/or drilled rotors are not recommended for the track and are more likely to warp and crack. They swear by the cheap standard Centric blanks and now I see why. I just thought I would update this but the pads do seem to squeak a bit when coming to a complete stop. I think lubrication and adjusting the shims may help (also note that the car squeaked before replacing pads so maybe it is just the calipers themselves). The groaning is still there but seems to be slowly improving. Most importantly though the braking performance is still excellent and this is saying a lot for an Aristo since most people including me complain the brakes don't work well. If anything I think the braking performance has even slightly improved over the weeks. There is definitely more brake dust compared to what I think were ceramics the car had on before but it is not a huge difference. I now have about 3 years of experience with these pads. I ran a metallic set on the front of Celsior for about 2 years (although I would say the last 6 months stopping power diminished and they started squeaking). This is to be expected because metallic's are not exactly supposed to be long lasting. I also drive a lot and would estimate I put at least 60K on the pads. I just had a new replacement set installed on the front of Celsior last week and after bedding them in nicely the car stops on a dime once again (you will lose traction before the pads become a limiting factor). It stops even better I'd say now that I put a set of Centric metallics on the rear in the summer. I've now had 3 sets of these pads between Aristo and Celsior and the quality has been excellent and predictable. I'm very pleased with the longevity and performance of the pads and they seem to keep getting cheaper yet the quality remains just as good! I'm definitely never buying anything but the Centric's after this very consistent experience. In my mind there's no reason to pay extra for the performance pads when Centric really delivers with their metallics. I'm very curious though how their Ceramics compare. My only complaint with the metallics is that they do make a lot of brake dust and they don't last long. I really don't mind it considering the incredible braking performance they deliver. I would imagine the ceramics would last longer, produce little to no dust but would not stop quite as well.